Asante Alliance is a Boise based staffing and consulting firm with over 25 years experience. They provide the specialists who implement massive IT systems in hospitals. Their logo evokes both a sense of institutional-structure and nimbleness. The orange shapes represent the myriad IT applications they deal in. While the thin angles of “Asante” — juxtaposed with compact letters in “Alliance” — provide an open and approachable vibe just as it promises serious results. 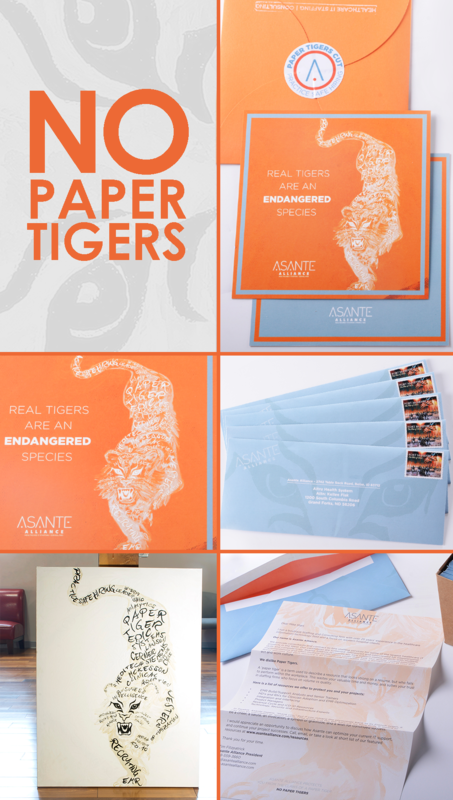 A paper tiger is an IT resource who looks good on a résumé but who can't deliver once they get in the room. These résumés are typically filled with buzzwords (as well as inaccurate self-representation), so c308 commissioned a local artist to paint the silhouette of a tiger using industry jargon. It became the symbol of the campaign. As well as the perfect hook-slash-worst-case-scenario to contrast Asante Alliance against when pitching their services.